Our Mission, is to provide a place for you within the Quilter’s Guild of Ireland, whether you are a lone quilter or a member of your local group. Each and everyone has a place within the Quilter’s Guild of Ireland. We hold an annual conference/retreat each year in April. It is a treasured weekend, where new friendships are made and older ones renewed. Whether you attend on your own, or with a few friends or a group, you are sure to leave inspired by members’ work, the teachers and the workshops. Following our 2018 AGM, we shall be producing a regular newsletter. 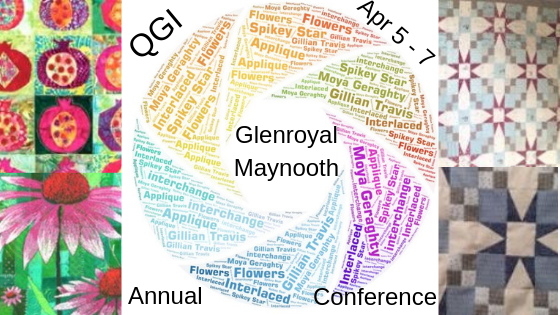 As members, you will be invited to take part in the various QGI activities which will be held throughout the island of Ireland. Membership Fee is still only € 30.00 or £ 27.00 p.a. *Junior Membership is € 10.00 or £ 10.00. This needs to be posted to the membership secretary, with permission from a parent or guardian. Ages from 7 – 17. Or download the Membership in word format from here. Payment acceptable by cheque OR bank transfer. “It looks like we need to add our BIC number to the bank details on all correspondence as one member required this. I have spoken to the bank and they tell me that the IBAN and sort code are sufficient unless it’s an international deposit. In most cases the problem lies with members being confused with letters and numbers: eg zero and letter o or number 1 and the letter I. The bank details are correct and work for the majority. *Junior Membership applies to Young Quilters between the ages of 7 and 16. They will be on the mailing list and will be entitled to exhibit in our exhibitions.